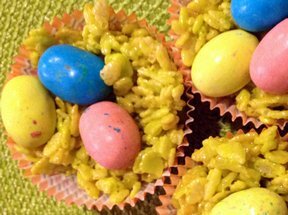 These cute little Easter nests are not only decorative but they are also fun to eat. 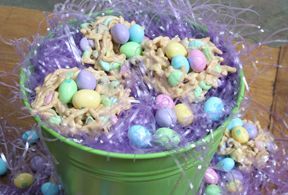 The sweet coconut and crunchy chow mein noodles provide great flavor and texture to this Easter treat. 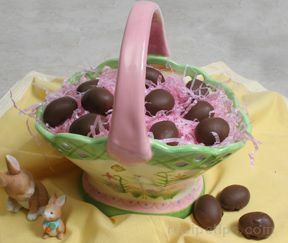 See how to make this and other Easter candy at home. Prepare a cookie sheet by lining it with a sheet of wax paper or parchment paper. Melt the white chocolate chips over low heat. Do not use too high of heat because if the chocolate overheats it may separate and become grainy. Stir the white chocolate until it is all melted. Remove from the heat and add the vegetable oil. Stir until the white chocolate is creamy and smooth. Add the chow mein noodles and coconut. Stir these ingredients into the white chocolate until evenly coated. If the mixture seems a little too moist to be able to form the nests, add a few more chow mein noodles. Start by adding no more than an additional 1/4 cup. Divide the mixture into 8 even amounts. Place them on the parchment lined cookie sheet and use your hands to shape them into nest with a hollowed out center. Once all the nests are shaped, place them in the refrigerator for approximately 30 minutes to harden before filling. 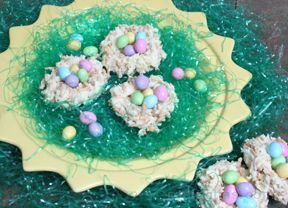 Remove from the refrigerator and fill each nest with Peanut M&M's or other Easter candy, such as jelly beans. "The combination of white chocolate, coconut, and chow mein noodles made these hard to resist."